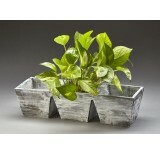 White Washed 3 Compartment Wooden Container; Fits three 4" plants; 14.25" x 4.25' x 4" Plastic liners included. ..
White Washed Bamboo Bowl; 8.25" dia x 4" high; Plastic liner included. 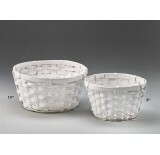 ..
White Washed Bamboo Bowl - 10"
White Washed Bamboo Bowl; 10.25" dia x 4.2" tall; Plastic liner included. 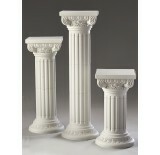 ..
Adjustable, White Plastic Pillar; Includes top, bottom and two 10.5" tall column pieces. **This item is only sold by the case of 2. Please order in case pack multiples. 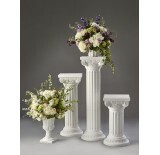 ** 13.75" wide x 36.25" tall (with two column pieces); or 25" tall (with one column piece) ..
White Plastic Urn; 11.75" opening x 15.75" tall ..
4.75" Machine Glass Cube (utility glass); 4" opening **This item is only sold by the case of 12. Please order in case pack multiples. 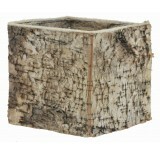 ** ..
Square Birch Container; 6.25" x 6" tall; Plastic Liner Included; **This item is only sold by the case of 4. Please order in case pack multiples. 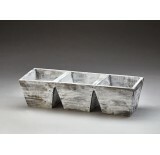 ** ..
Collapsible Wooden Tray with Metal Handles; white wash finish; **This item is only sold by the case of 2. Please order in case pack multiples. 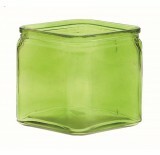 ** 14" x 8.5" x 2.25"; overall height: 12" ..
Moss Green Glass Cube; 4.5"x 4.5"x 4.75" Tall **This item is only sold by the case of 12. Please order in case pack multiples. 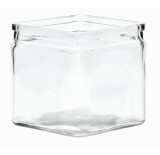 ** **CLOSE-OUT PRICING** Regularly 12/$2.29 ea. ..
Glass Gathering Vase - Champagne *VERY LOW INVENT.. 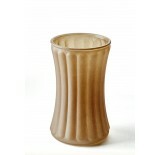 Champagne Glass Gathering Vase; 4.25" opening x 8" tall **This item is only sold by the case of 6. Please order in case pack multiples. ** **CLOSE-OUT PRICING** Regularly 6/$2.99 ea. 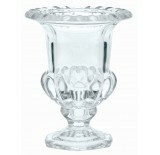 ..
Petite Ribbed Glass Pedestal Vase - 4" Opening x 4.5" Tall **This item is only sold by the case of 12. Please order in case pack multiples. 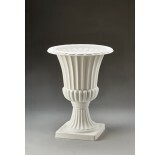 ** ..
Petite Ribbed Glass Pedestal Vase - 3" Opening x 5.5" Tall **This item is only sold by the case of 12. Please order in case pack multiples. 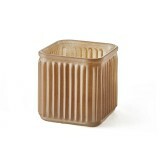 ** ..
Champagne-colored Ribbed Glass Cube; 4.5"x 4.5"x 4.75" Tall **This item is only sold by the case of 12. Please order in case pack multiples. ** **CLOSE-OUT PRICING** Regularly 12/$2.99 ea. 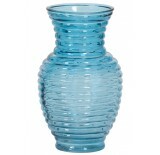 ..
Ribbed Glass Vase - Turquoise; 5" opening x 11" tall **This item is only sold by the case of 6. Please order in case pack multiples. ** **CLOSE-OUT PRICING** Regularly 6/$6.99 ea. .. Round Woodchip Container w/ Painted Jack-O-Lantern.. 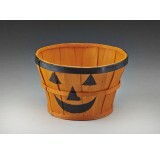 Round Woodchip Container with Painted Jack-O-Lantern Face 8.125" dia x 5.25" tall ..
Unpeeled Willow Peanut-Shaped Basket with Handle; Fit's two 6" pots; Plastic Liner Incldued **This item is only sold by the case of 4. Please order in case pack multiples. ** .. 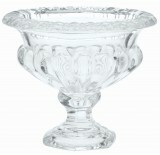 Since 1982, Longhorn Imports has served the gift basket, floral and gift industries with premium wholesale products. 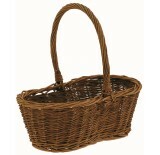 We're sure you can find what you need from our line of willow baskets, stacking boxes, metal containers, and novelty items. Click on the links above for a quick sampling of our diverse product line. Ready to place an order? We now offer on-line ordering. Need to speak to a "live" person? Call us at 1-800-641-8348. We look forward to doing business with you!